I wrote an article recently for a media publication on how to optimise for Universal Search within Google. universal Search is relatively new within SEO circles and had been fully utilised by Google of late. When you search for something in Google, and it’s a popular search term with a lot of media, you may get videos, images and news results appear on the front page. This makes regular SEO much harder, because you’re competing with other factors for first page placement. For example if your website used to rank at #8 on Google for your main keyword, and that keyword now shows results from Universal Search, you’ll be pushed down to the second page. However, it does open up new opportunities in SEO (as I wrote in the article) as SEOs are now able to optimise for Universal Search specifically, with the use of images, video and even Google News. An example of this is one of the key phrases I’ve been receiving a lot of traffic for recently, ‘michael jackson thriller costume’. Not very competitive, but with Halloween not that far away it will start bringing in the numbers. Searching for this phrase in Google shows up some images on the front page, with my own personal Thriller jacket there too. 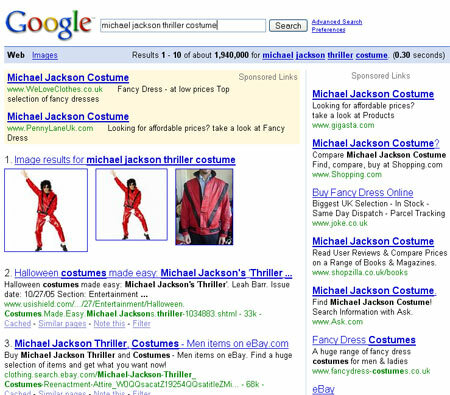 You can see Google’s SERPs for ‘michael jackson thriller costume‘ here. Universal Search is something worth experimenting with if you haven’t already. You can see my original post, the one that ranks in Google’s Universal Search, here.